owls about that then! : Barn Owls are back! Some of you out there may recall last year (2012) we had an enormous amount of success at one particular Barn Owl site, mainly down to the dedication of Glyn, "the guardian of the owls!" 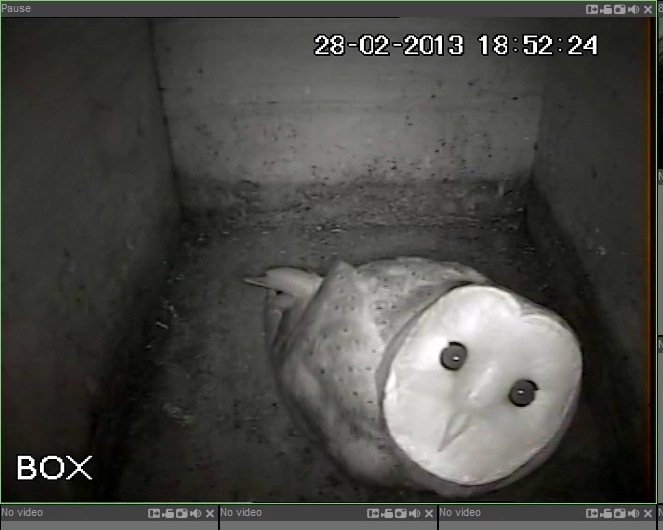 Prior to the breeding season we (Glyn, Daz & I) took a gamble and mounted a couple of cameras in the barn & nest box, and lucky for us the birds opted to use the box. 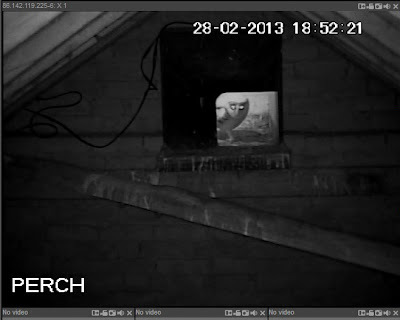 We were then able to monitor them quite closely via the cameras, the Internet and from the luxury of our homes. The breeding owls had two separate broods and in total successfully raised 7 juveniles. I now suspect that a lot of the local sighting of Barn Owls that I have made so far this year are quite probably the youngsters from this site? So that now brings us to this year, had both of the owls survived the harsh winter and if so would they use the box again? 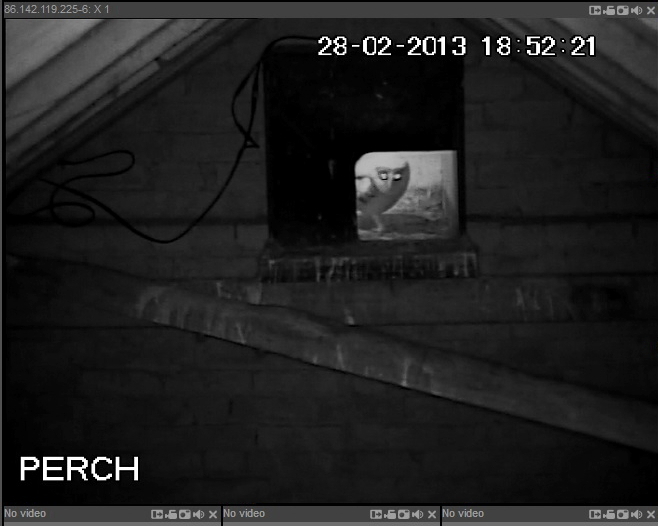 Well after monitoring the cameras over the last few days things look very promising indeed. On Feb 28th a single owl was recorded in the barn, which is good news in itself but even better than that it was having a good look around inside the box! 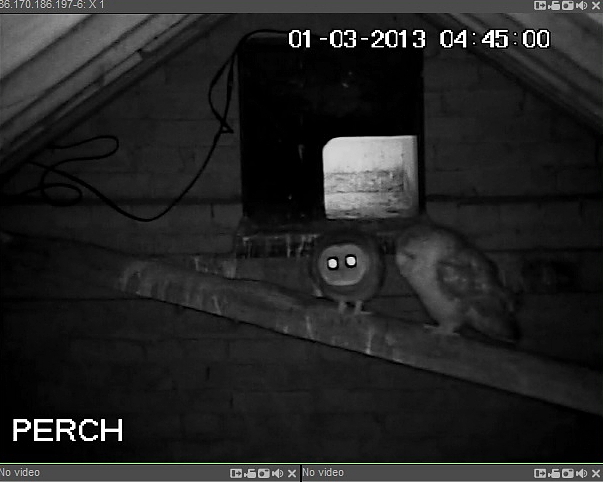 Then on Friday night another look via the motion detection recordings and whoopee, a pair! I know that another local farmer has recently erected a nesting box in one of his out-buildings, which is obviously good news. But, I do hope that they just use that as a roosting site and choose our box to breed in again. I know they will be making up their minds very soon as last year their first egg was laid on March 21st! SO COME ON OWLS DO THE RIGHT THING AND CHOOSE OUR BOX.......PLEEEEEEEASE! My fingers are crossed for you. Hopefully they'll do the right thing. Brilliant work,hope luck is on your side. An hour in the snow.